The combination of photos show Justin Morin, chief executive officer for Digicel Jamaica with athletes from Calabar (left) and Edwin Allen, displaying their cheques, after the schools won the fourth staging of the Digicel Grand Prix Athletics Championship on Saturday night at the National Stadium. (PHOTO: Marlon Reid). Calabar High and Edwin Allen were crowned winners of the fourth staging of the Digicel Grand Prix Athletics Championship, which ended at the National Stadium on Saturday night. The Digicel Grand Prix Athletics Championship is a five-series development meet for high schools, which comprises four regional meets and Saturday's Grand Finale - the G C Foster Classics. Calabar compiled 146 points to beat nearest rivals St Jago High, the 2017 champions, by all off 72 points. St Jago ended with 74 points. Kingston College (KC) 54.5 points, Jamaica College (42) and Petersfield High (35) round off the top five boys' schools. 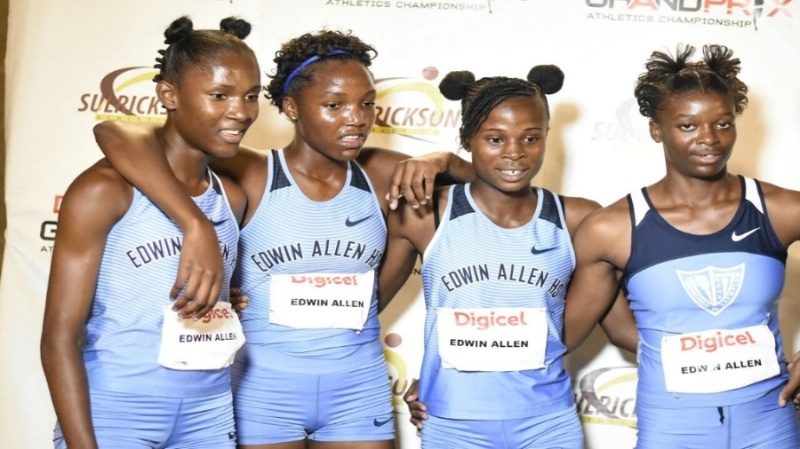 Edwin Allen ended with 144 points, beating second-place Holmwood Technical (113) by 31 points for their fourth straight girls' title. Hydel High (82.5), Excelsior High (48) and St Mary High (37) round off the top five. Calabar and Edwin Allen were each presented with $1 million toward gym equipment or development of their school’s training facilities for winning the respective titles. Holmwood Technical (girls) and St Jago (boys) walked away with $500,000 for second place finishes, while Hydel High (girls) and KC (boys) received $200,000 each for third place finishes. Calabar totally dominated the track events winning six of the 13 finals along with a field event, which produced a championship record. The field event, which produced the new championship record for Calabar was the Boys' Under-17 long jump final where they scored 16 points courtesy of a one-two finish. On the track, Calabar's best performances came from Christopher Taylor in the Boys' Under 20 400-metre final and the 4x400-metre relay team, in which Taylor ran the second leg. 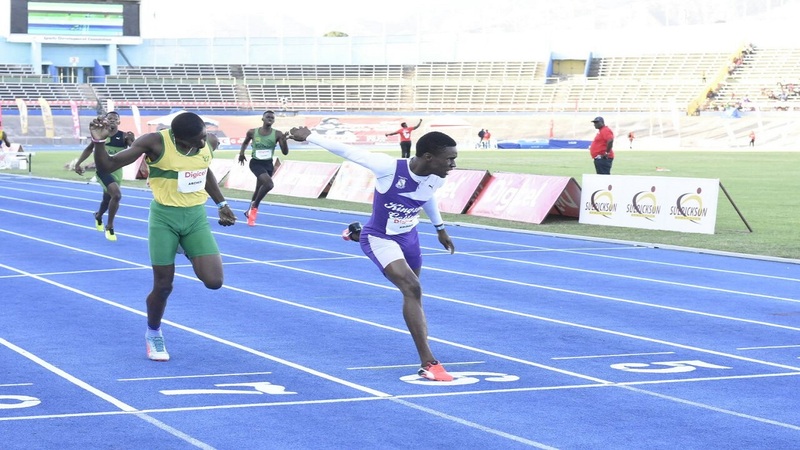 Taylor proved a cut above his rivals in the Boys' Under 20 400-metre final, winning unchallenged in 45.92 seconds, just falling short of his series best of 45.84 set at the Corporate Area Championships, the second regional meet of the Digicel Grand Prix Series. Maneesh Vassell of Rhodes Hall won the battle for second place over Holmwood Technical's Bovel McPherson. Both athletes were credited with the same time of 48.02 seconds. The Boys' 4x400-metre team, with Taylor running the second leg, also won unchallenged in a very fast time of three minutes 06.37 seconds, which represents the second fastest time recorded by Jamaican High School team this year. That race was marred with a big controversy as the starters called back the event after the first leg runners, minus Shemar Chambers had covered about 100 metres. The Calabar High opening leg runner was left stranded out of his blocks in what appeared to be a false start. However, the starters after deliberating ruled that it was a faulty start and Calabar were allowed to take part. The remaining members of the team were Anthony Carpenter and Malik James-King. The quartet also held the fastest ever time recorded by a Jamaican High School team after they posted an eye-popping 3 minutes 05.04 seconds at the Corporate Area Championships. Jamaica College (JC) set the previous Jamaican high school record 21 years ago at the Mutual Life Games at the National Stadium. The quartet of Rudolph Mighty, Edward Clarke, Carl McPherson and Rupert Eldemire clocked 3 minutes 06.56 seconds then to set the record. Calabar High also won the Boys' 800-metre sprint medley open by posting three minutes 25.72 seconds to hold off JC, which came home in three minutes 25.95 seconds. Calabar High and Petersfield High shared the 200-metre finals. Calabar High secured the Under 20 final through Anthony Carpenter, who won easily in 21.37 seconds, while Petersfield High's Antonio Watson took the Under 17 200 metres in 21.39. KC and Excelsior shared the 100-metre finals. Terrique Stennett handed KC victory in the Under 18 100-metre final with a 10.82 clocking, while Excelsior High's Kimani Gardener won the Under 20 100-metre final in 10.60. KC also had a one-two finish on the day, this in the Boys' Under 20 long jump. Wayne Pinnock turned in a big effort to erase the championship record on his way to victory over his teammate Shacquille Lowe. 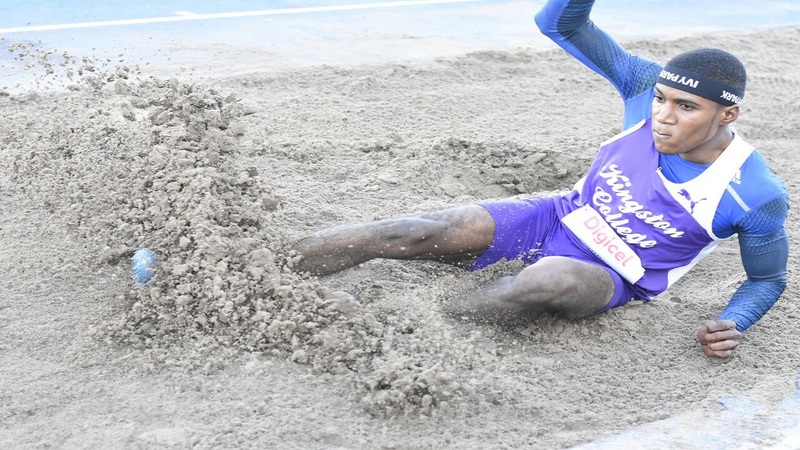 Lowe cut the sand with a mark of 7.35 metres for second, with third going to Daniel Bogle of Wolmer's Boys with 7.25 metres. Edwin Allen accounted for seven victories, four coming on the track. 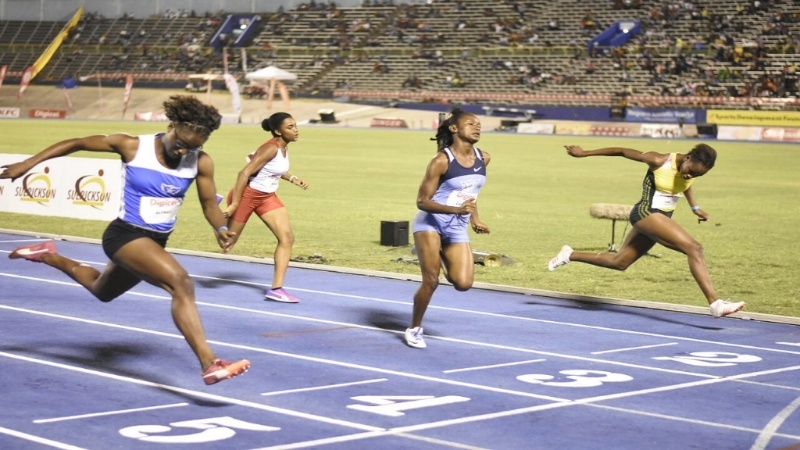 The Frankfield-based school best effort came from star sprinter Kevona Davis, who won the Girls' Under 20 200-metre in a new championship record time of 23.13 seconds, which erased the previous mark of 23.69 set by Petersfield High's Ockera Myrie. Holmwood Technical's Micha Harriott was well beaten into second in 23.42, also faster than the previous championship record. Edwin Allen also won the Under 17 200-metre final through Tina Clayton who clocked 24.47 to beat Kerrica Hill (25.07) of Hydel High. Rushana Dwyer (Under 18 800m in 2:12.86) and the 800-metre sprint medley open (3:54.95) were the other track victories from Edwin Allen. Holmwood Technical's Rickiann Russell also turned up in record breaking form. 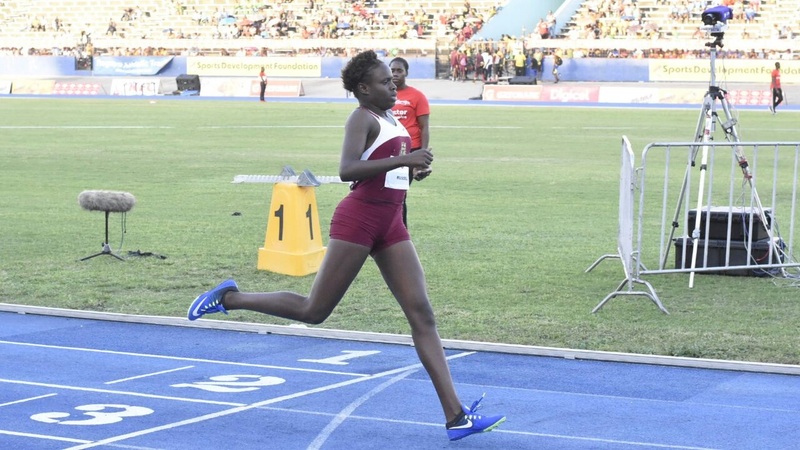 Russell won the Girls' Under 17 400 metres in a new championship record time of 54.41 seconds, which erased the previous record of 54.49 set by Joanne Reid of St Jago. Hydel High's Dejona Simpson finished well behind into second place, crossing the line in 55.53. Hydel High hit back in the Girls' Under 20 400 metres through Charokee Young, who won in 53.42. Janielle Josephs of St Andrew High finished second in 53.80. Digicel will pay $25,000 for each championship record.